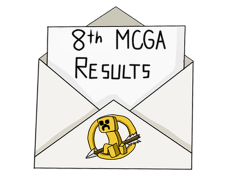 The 8th Official MCGamer Awards - Final results! Unfortunately, the 8th MCGamer Awards has come to an end. However, we’re proud to announce that this edition's MCGamer Awards was a success! Thank you to everyone who took part in this amazing event. This event wouldn’t have been a success without all the submissions we got. Congratulations to all the winners of the 8th MCGamer Awards! The 8th Official MCGamer Awards – Final Voting Round! This is the final round of the MCGamer Awards. The MCGamer Awards Crew have calculated all of the votes that you tributes have sent in. This edition of the MCGamer Awards is an nominations-elimination-finals edition. The first round was the nomination round, per award you could submit the names of the people who you think would be qualified for that certain award. Per category 5 nominees went through to the second round. That round was the first elimination round. In the poll on the last thread, the majority ( 66,7%) voted for directly moving on to the final round, so that's where we're at now. The 8th Official MCGamer Awards – Eliminations! This is the first Eliminations Round for the MCGamer Awards. The MCGamer Awards Crew have calculated all of the nominees that you tributes have sent in. This thread will conclude the nomination round and we can announce the nominees! This edition of the MCGamer Awards is an nominations-elimination-finals edition. The first round was the nomination round, per award you could submit the names of the people who you think would be qualified for that certain award. Per category 5 nominees went through to the this round. This round is the first elimination round.